Green Toys Inc. makes an awesome line of classic children’s toys constructed from recycled plastic and other environmentally friendly materials, and Green Team is now a distributor. The main “ingredient” in Green Toys is recycled plastic milk jugs, and the toys are 100% made in the USA. The toys contain no traceable amounts of Phthalates or BPA. They are also designed without any external coatings, eliminating the fear of lead paint. All Green Toys products are packaged in recycled corrugated boxes with no plastics, cellophane or twist-ties, and are 100% recyclable. 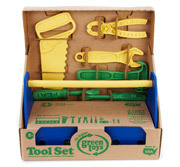 Apply for a Green Team account today to order fantastic green products like Green Toys. This entry was posted in Blog and tagged green toys, green toys distributor, non-toxic toys, wholesale green toys. Bookmark the permalink.